I was really excited last week when the call went out for Canberra’s best ice cream. I was watching the RiotACT site all day, waiting eagerly to see where readers were going to send me. The same business was nominated over and over again, with one reader even scolded for daring to recommend Goodberry’s. That’s how I found myself out the front of Frugii Dessert Laboratory in Braddon on Wednesday night at 9pm. The shop, which is in the new Ori building on Lonsdale Street, had literally opened that day. There was a pretty big line, and I’m not a snob, but I just don’t do lines, so I left. But I did go back on Thursday at 11:50am to be exact, and waited eagerly for the doors to open. I was told that the shop would be opening late due to a delayed dessert delivery, so I waited maybe 15 minutes. By the time the doors opened another long line had formed. Lucky me, I was first in line! I really struggled choosing just one flavour, so instead I tried two: salted butter caramel and pistachio. 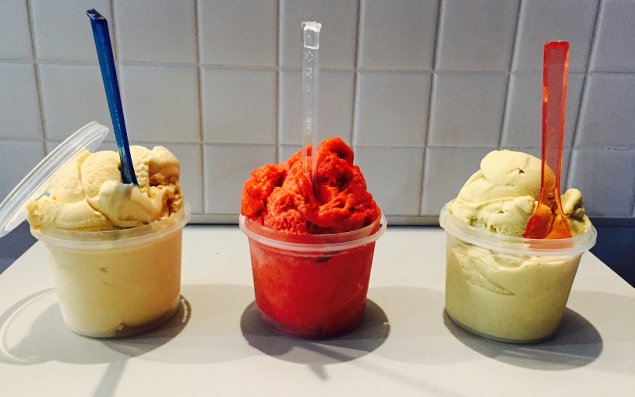 At $5 for a little container, it’s good value – the staff pack them full, way over the top with ice cream. I sat down to enjoy my ice cream, and oh em gee! I have never had ice cream that tasted like Frugii. The salted caramel tasted like real homemade caramel sauce and the pistachio ice cream, texture aside, if I had closed my eyes, I would have thought I was eating a packet of pistachios. A-mazing! Last week I couldn’t choose a winner and this week there was not even any competition. You called it Canberra. Well done! Frugii for Canberra’s best ice cream!